It was a poignant moment that included blessing patients and, yes, greeting a few clowns. 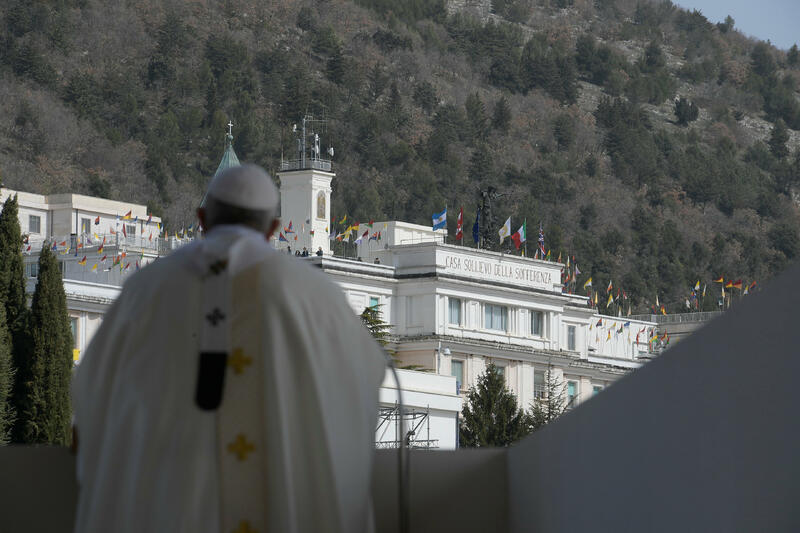 Pope Francis made a stop at the House of Relief of Suffering Hospital on March 17, 2018, part of his visit to Pietrelcina and San Giovanni Rotondo, the places most associated with Saint Padre Pio. From the square in front of the hospital, Pope Francis greeted and blessed the patients. He then visited the 21 young in-patients in the Pediatric Oncology Ward, on the third floor, and the private Hospital School, finally greeting the “Clowntherapy” volunteers. Padre Pio set up the “cathedral of charity” known as the “House for the Relief of Suffering”, according to the hospital’s website. San Giovanni Rotondo had no hospital facilities as such. Thus Padre Pio had great pleasure when the premises of the former St. Clare’s convent were turned into a small nursing home. “Saint Francis’ civil Hospital” was opened on 25 January 1925 and comprised two wards with seven beds each, as well as two rooms where the poor could be nursed free of charge. However, following major damage caused by an earthquake in 1938, the nursery home was closed down thirteen years later and its premises were subsequently refurbished and used as a kindergarten. Yet Padre Pio’s idea of charity outlived the destruction caused by the earthquake: on the evening of 9 January 1940, the friar came up with the idea for a “House for the Relief of Suffering”. Padre Pio’s children in faith promptly joined in on the idea and the first stone of what was to become the “cathedral of charity” was laid at the end of the war, on 16h May 1947.